Mass shootings — like Sunday night’s massacre in Las Vegas, which resulted in at least 58 deaths and 500 injuries — have an effect much larger than what can be measured by numbers. These violent events have a ripple effect, weighing heavily on the mental well-being of an entire network of people, according to Sherry Hamby, research professor of psychology at the University of the South and founding editor of the American Psychological Association journal Psychology of Violence. Hamby stressed this kind of violence affects more than just those who were physically present when the shooting began. The most common mental health consequences for people immediately affected by large-scale acts of violence resemble post-traumatic stress disorder, a condition generally associated with military service members, Hamby said in a Skype interview with Mic. For example, such waves of emotional trauma are still running through the LGBTQ community in the wake of the 2016 shooting at Pulse nightclub in Orlando, Florida, where 29-year-old Omar Mateen killed 49 people. Luckily, systems for dealing with the mental effects of Sunday’s events are already forming. For example, Mandalay Bay Resort announced it established dedicated phone numbers for guests and employees seeking professional crisis counseling. The American Red Cross is similarly working to provide mental health care for those affected. 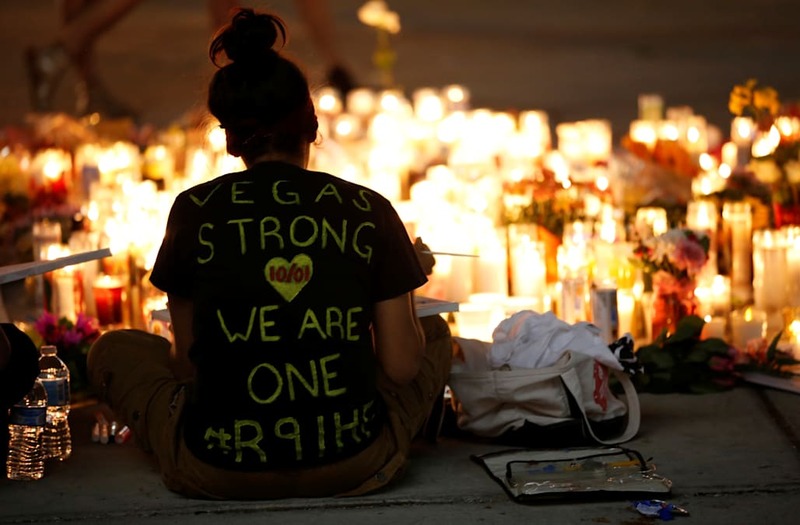 If someone doesn’t choose to seek professional help, Hamby said, there are a number of other ways people impacted by the violence in Las Vegas can find treatment. According to Hamby, these kinds of memorial events serve not only a symbolic function, but can actually help reinforce the social networks that serve a crucial role in aiding those suffering from stress. Despite the importance of these types of rituals on one’s mental health, it’s important to note there are still vast gaps in academic research on the effects of gun violence. According to those in the field, that’s primarily a result of actions Congress took under extreme pressure from the National Rifle Association in 1996. In short, a portion of a 1996 appropriations bill said the Centers for Disease Control and Prevention — the agency whose jurisdiction this research falls under — could not use its funding “to advocate or promote gun control,” a vaguely worded phrase that has since kept the agency from touching any kind of research related to gun violence, according to Smithsonian magazine. In the wake of the Sandy Hook shooting in 2012, former President Barack Obama finally lifted the CDC’s bans on research related to gun control, but researchers say obtaining funding for gun violence research is still difficult. Furthermore, they say the freeze on this research had a crippling effect on our academic understanding of overall gun violence. “I just think that the relationship between the rate of gun death versus the amount we spend researching that cause of death is unconscionable,” Jonathan Metzl, professor of sociology and psychiatry at the University of Vanderbilt, said in a Skype interview. “Gun violence receives the second-least amount of funding in this country in relation to the amount of injury and death that it causes. “In a way, this question of how can we stop this problem [of gun violence] is made much more difficult by the real lack of knowledge ... that should be important to everybody,” Metzl added. Hamby echoed Metzl’s message, saying that instead of committing the appropriate resources to gun violence — the third-leading cause of death for children in the U.S. — researchers are forced to piece things together from other disciplines. No, Sam Hyde is definitely not the Las Vegas shooter. That won’t stop his fans from pushing hoax. White House press secretary says we shouldn’t politicize tragedy. That’s never been Trump’s rule.